When a professional, black piano player hires a white nightclub bouncer to drive him on a 2-month concert tour through the Deep South in 1962, an awkward road trip turns into a journey of sobering self-discovery. The title refers to a guidebook published for African Americans to inform them of hotels, gas stations, and restaurants across the southern states that would allow them inside. Our traveling duo uses the Green Book on their trip, and they learn different ways to endure the varying forms of racism along their itinerary. 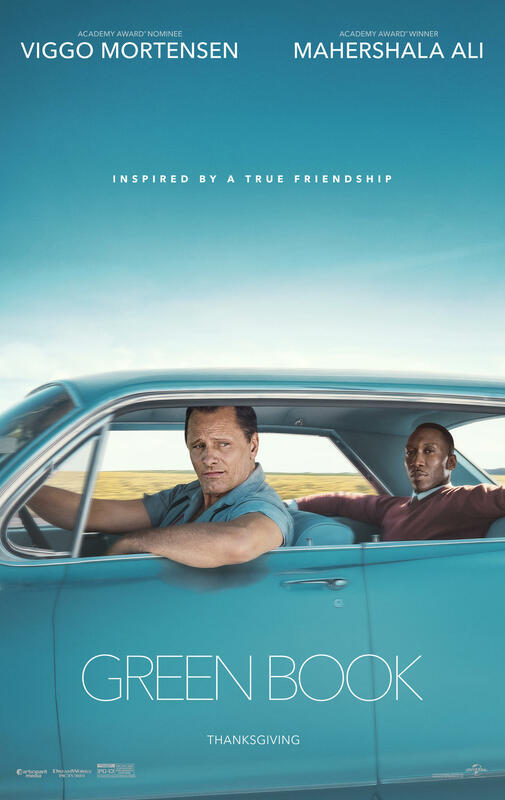 This movie is based on a true story and features some nicely crafted dialogue between the 2 leading actors Viggo Mortensen (The Road, 2009) and Mahershala Ali (Moonlight, 2016). And that’s what makes Green Book special. Like Driving Miss Daisy (1989) or The Help (2011), this film shows a lightened or dainty view of racism with a whole bunch of family love and heart-warming humor included (no doubt to help make this film easier to watch for white viewers.) It doesn’t get dark or violent. But Green Book excels because of the relationship between the refined, well-read, reticent, black musician and his blue-collar, fast-talking, white chauffeur. It’s not just about race. Green Book also explores class differences and how those differences divide us. Remember a couple months ago when I said movies are having a mini-Renaissance the latter half of this year in Black-centered, contemporary stories? Green Book is another part of this mini-Renaissance, even though it’s a fairly sanitized part.